I am following SAP Community Blogs (@sapCommBlogs) twitter account and got a tweet on SAP GUI for Java 7.5 yesterday. I understood that SAP GUI 7.5 is also available to download and install. Yes, it was released on 4th of May and ready for downloading. So I downloaded it and installed. New features are mentioned in below note. You can learn more from the note. You can also try SAP GUI 7.50 and share your comments. Does anyone who installed GUI 750 have a process that logs into SAP, executes an RFC enabled function module that imports data from Excel and passes data from SAP back to Excel, that still works? We have a process that we have been using for 10 years. GUI 750 will not work with classic RFC. The following URL is a SCN post I created that explains the issue in detail. Removal and replacement of librfc32.dll by NWRFC. 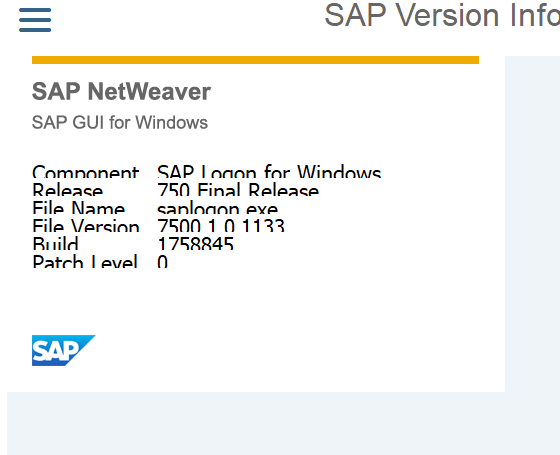 Due to technical reasons the old RFC library was removed from SAP GUI and replaced by the new SAP NetWeaver RFC Library. 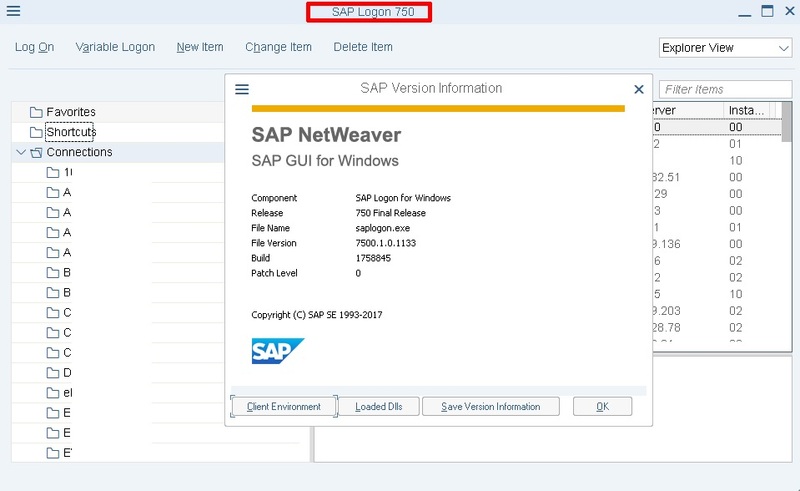 please check SAP Note 2256415 – “Adaptation of RFC controls () to use SAP NetWeaver RFC Library” for information on potentially required adaptation steps. Did you ever find a solution to this? We are just running into this as well we also have an excel process using a macro to upload to SAP. We are trying to research how to change the macro code to use the sapnwrfc.dll file rather than the librfc32.dll file but I haven’t been able to find anything yet. I have checked the note 2417687, but the developers need more information. when I have to installed the SAPGUI 7.50 I have noticed the problem. The SAPGUI is opened but I don’t show the dialog login window. When changed the directory of xml structure the sapgui doesn’t work. It’s normal? Other people have my problem? Did you try uninstalling all components of SAP GUI and reinstalling it from scratch? Also try renaming the Local Configuration Files folder under AppData. Now, i have changed the name of folder “Local Configuration Files” and the sap gui is now stared. I have reuploaded withe success the old configuration of xml entries. I have noticed one difference, I have, in the sap gui 7.40, the shortcuts with the password inserted, now with the new sap gui 7.50 is disabled. Is possible to renabled it or not (via regedit)? is the issue with passwords for shortcuts fixed for GUI 7.5? Have the same issue as mentioned above when I can’t save a password for a shortcut. I know that, this functionality is not coming with standart GUI config. As far as I remember there was a registry entry. You can find it by googling and configure it accordingly and import your old config. yes, you are right, there was a register entry for 7.4, but for 7.5 it’s not working. Did you get a solution for your problem? Trying out 7.50. When i want to create a FORM routine in the ABAP workbench (no not in Eclipse) through double click, nothing happens. The screen simply locks after confirming that i want to create a new FORM routine. I have the same problem. I can not find a solution, I just hope some patch solves it. after installing SAP GUI 7.50, my vba script does not work anymore. Good morning, any progress in getting your VBA script to work? it is not working for us as well while we try to use it Using SAP GUI 7.5 patch level 2 still scripting at packaging level is not working for changing the regedit values . do you get any solution for the same ? I got the same issue.. Trying to create Perform form and double clicking on it, hangs the screen..
Also About login shows the screen .. Please advice..
Wow. Still no native support of HDPI monitors? Is it me or does this version look damn ugly. I mean what were they thinking. SAP really need some decent GUI designers to get this right. 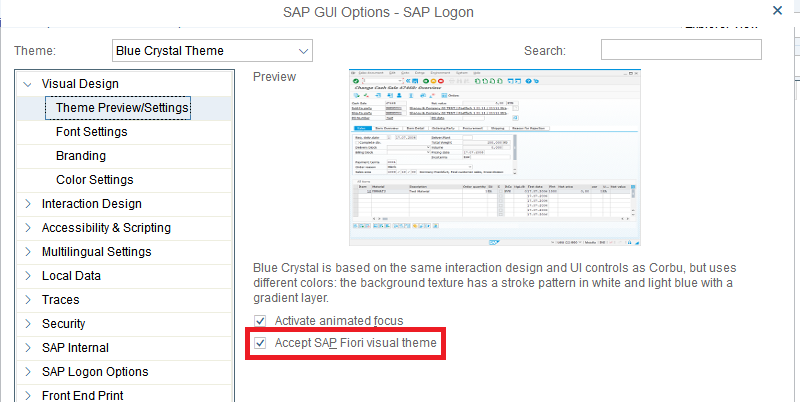 You can revert to the older logon pad them by un-checking “Accept SAP Fiori Visual Theme”. I was suffering with this new look. After installing SAP GUI 7.50. In ABAP editor , some key word like ‘DATA’ , can’t auto Completion. Some key word like ‘Tables’ work fine. I already checked the “Enable Auto Completion” in editor setting. Any body has the same problem? I have a great SELECT with multiple JOIN and the new OpenSQL Syntax CASE. When calling in the Editor I get an “Error in Parser” and the GUI crashes. I have the same error in SE80, SE38 and SE37 for example. I did the installation of patch 01 of SAPGUI 7.50, but the error continues. According to SAP, Patch 2 will be published in week 37… we will see. With patch 1 – hotfix 1 die error continues. Do we have any solution for the same. SAP GUI 7.5 BEX Analyzer Issue. Hi – The BW Bex Analyzer was working fine with SAP GUI 7.4, but we just recently installed 7.5 and now it is not working. Based on the error “service unknown”, we applied workaround by entering the BW system and port into the Windows services file, ie sapmsSID 3601/tcp. This worked. However, we can’t do this for all of the users. Is there a known issue or a patch that resolves BEX Analyzer after 7.5 installation? Thanks for any assistance or feedback. sapgui/signature_color is not recognized in 7.5 either. Does anyone have a workaround that does not involve touching the end users’ machines? I am having printing problems with SAP GUI 750 (SP 3 Hotfix 1). When I print some papers the GUI is stopped. Any Idea? Which access method are you using for printing? How many copies are you printing? SAPgui in general is only suitable for a small number of print jobs, not for background or mass printing. I am using the local printer (LOCL, Device: SAPWIN), When I print 30 or 40 pages, the SAP GUI is stopped. I have never faced such kind of problem. You’d better recreate this question on related tags in order more experts to see and answer. Are you using Access Method F, or G in this case? Are other users getting the same errors? Does the issue occur on the same gui version on a different PC? I am using access method G.
All users, all PCs with GUI 750 have the same problem.The problem occurs when they print some pages. Please contact your system administrator. A new version of SAP GUI for Windows needs to be installed. I have found that Eclipse ADT does not work with a virtual app installation of the SAPGUI 750, which is unfortunate, as that’s how our IT department roles out the GUI. Will there be an update of ADT that will support a virtual app installation of SAPGUI 750? I’ve got a strong interest in launching a remote call with kernel 750. I try various method, (select the appropriate library, change visual basic coding) but still import and export parameters are failing. Does anyone have a solution and a piece of working code to download a table to excel ? And the “error in parse” still goes on in the abap editor… unbelievable!